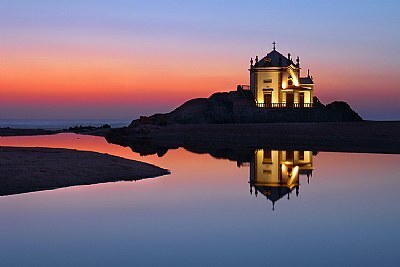 About This particular chapel was built almost at the sea on the top of rocks as an homage to the fishermans that died at this place.When the sea level rises it becomes isolated as an island.It is place of religious cult and at the end of day becames iluminated. Very nice image . Good work . Yummy colors and design...perfect moment. In my favorites. Such a brilliant photograph....it is so beautiful. Your portfolio is awsome. Outstanding work well deserved POD. Well deserved recognition; stunning detail and color. so nice colors, real nice reflection (maybe you should post it in this project), great composition, A real nice job. Wonderful lighting and perfect composition. This is too good. perfect place, perfect timing, perfect shot. Grande scatto , morbide le luci , caldi i toni , spettacolari i rifessi . Perfect shot. Excellent composition, right time of shooting. Superb. Beautiful colours, perfectly exposed. Surely in line for an award. sem duvida uma das melhores que já vi deste local, e são muitas!